When the weather gets cold and most of the animals head indoors, Lincoln Park Zoo tranforms into a a field of twinkling bulbs. 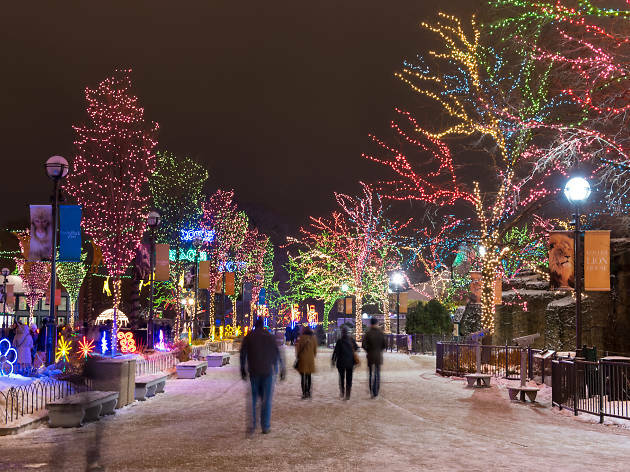 ZooLights decorates the beloved zoo with themed displays, perfect for a seasonal Instagram. Throughout the month, you'll also find ice-sculpture carvers and carolers joining the fun, as well as hot beverages available for purchase. 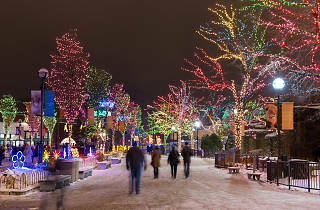 This year, ZooLights adds several ticketed events, including a Holiday Market (Nov 27), an adults-only night (Nov 29), a live performance of music from A Charlie Brown Christmas (Dec 9) and a Zoo Year's Eve celebration (Dec 31). My mom and sister were visiting from out of town, so I figured Zoo Lights was a good choice to take them to. They LOVED it, especially my mom. It was freezing that night, which I thought would make it a bad night, but we didn't even mind. It's nice that there are plenty of indoor opportunities with the different animals, so you can get a break from the cold if you need it. My only complain is that the penguin exhibit wasn't done yet! That's probably not the zoo's fault though because you know.... construction. I've been coming to ZooLights for the last 10 years and always have a good time. The lights are a fun and (more importantly) free way to entertain family or friends who may be in town for the holidays. Be sure to bundle up, though. Most activities are outside, but there are opportunities to get out of the cold and see some of the Lincoln Park Zoo's animal exhibits.